Are you ready to join our community of #FreedomBuilders? If you’re looking to establish a passive income and want to know how to find products to sell online, you’ve landed in the right place! 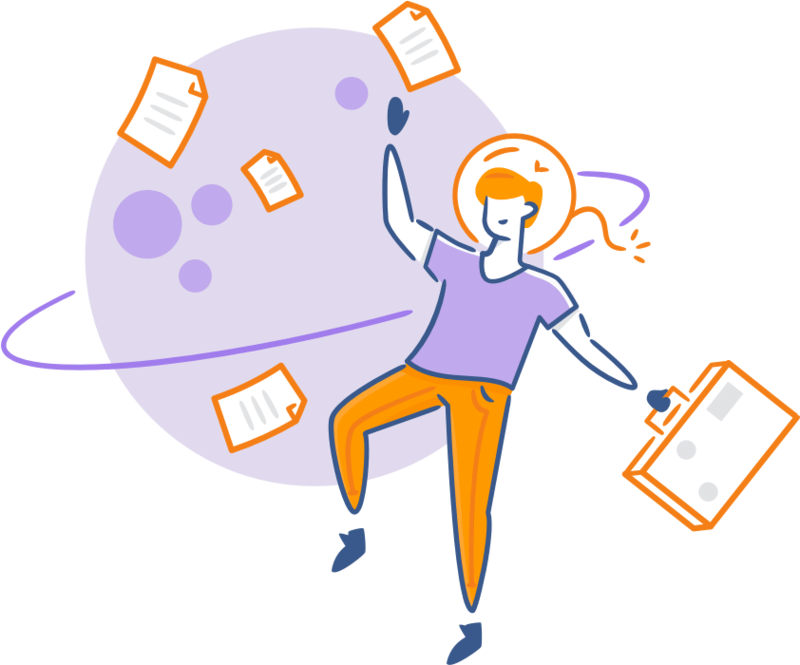 We’ll introduce you to the most comprehensive guide to product research including several out-of-the-box suggestions to get you started. This is the same formula we used to launch several successful products on Amazon. You can use the same process alongside your own goals to find the right product for YOU. It’s time to get the creativity flowing! Before we jump in – do you have your Jungle Scout Extension installed and are you logged into the Web App? We’ll be using Jungle Scout data to illustrate the simple strategies we use when evaluating products, so make sure you are set up and ready to follow along. What Is The Strategy For Finding A Good Product? The key to successful selling on Amazon is simple – sell a product that is in high demand, but with low competition. In fact, this can be said for anyone who wants to sell stuff online. This is basic Economics 101: you want to position yourself in the Amazon marketplace with high demand and low supply (supply = potential competitors). Once you launch your private label product you want to be able to capture the existing demand immediately without competing against too many other sellers. So how do you find these products that have high demand and low competition? 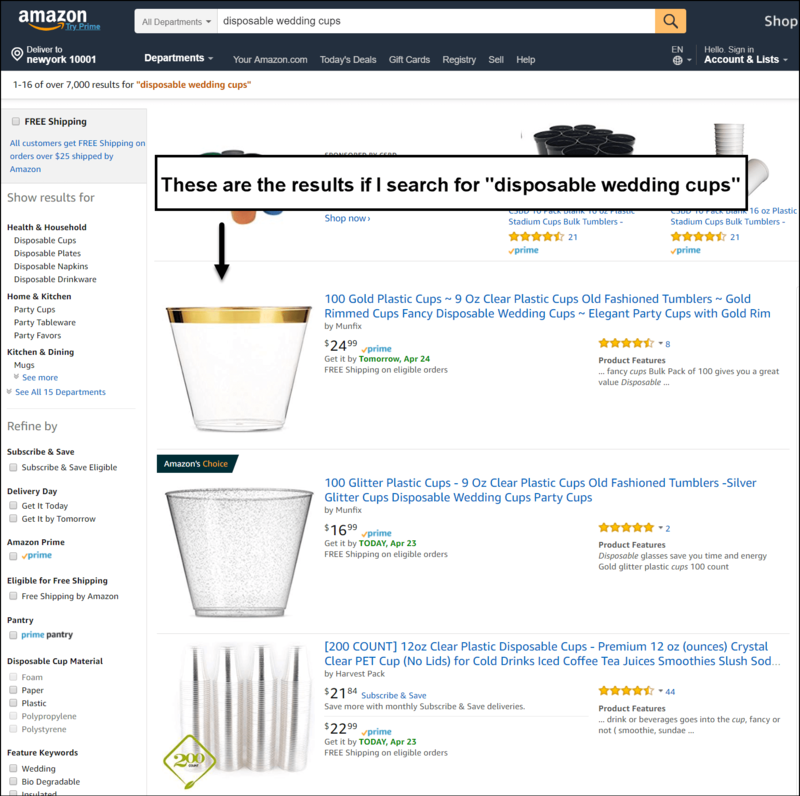 Amazon’s catalog has millions of products to look through, and we have all of the information you need to find that needle in a haystack. To simplify your product search, there are some key elements to keep in mind. If you stick to these general guidelines, you’ll be able to determine optimal private label products to sell. We discovered that this price range makes it easy to cover direct costs like Amazon’s fees, cost of goods sold, and advertising costs. Any higher than $50, and your conversion rate–the percentage of people that see your product and purchase–drops. We are after products to sell all throughout the year and not just during certain seasonal periods. The Google Trend Report is built right into the Chrome Extension to detect seasonal sales spikes you can easily avoid. It is much faster and easier to import via Air, so you want something that won’t be too expensive to import. 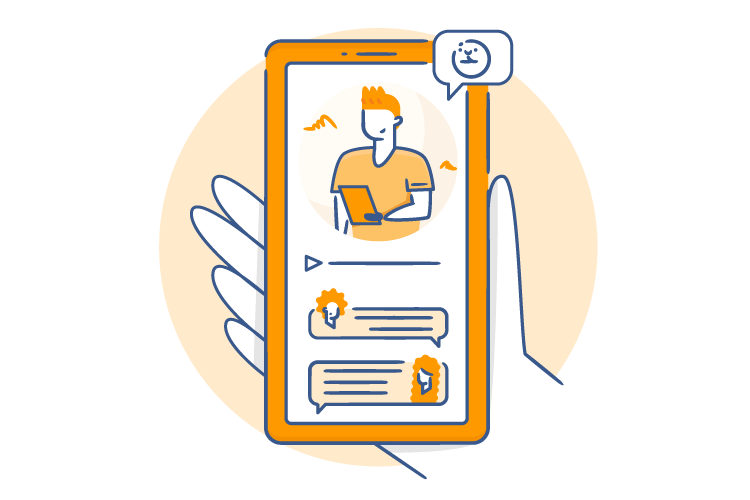 You can implement feedback from your competitor’s product reviews and create an improved and superior product. You don’t want to run into quality control or manufacturing challenges. Avoid glass, electronics, or highly complex products if you can. These are just guidelines, and a blueprint that we have used time and time again as a team of Amazon sellers. Every product has it’s own unique balance of opportunity vs competition. 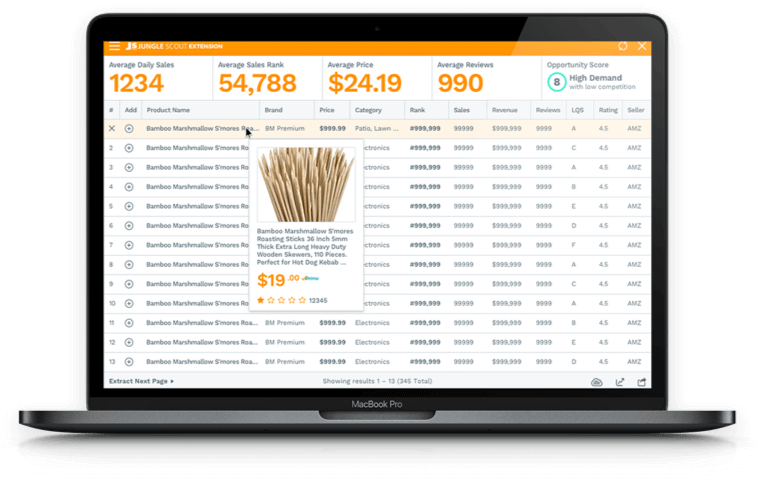 Using the Product Database in the Jungle Scout Web App, you have the power to scan through Amazon products by filtering key metrics such as price, demand, estimated sales, rating, seasonality, dimensions and more. As you find potential products you can add them to the Product Tracker feature and begin following the sales activity, inventory, Best Seller Ranking, and pricing over a period of time – which we advise you to do for a few weeks before deciding on a product! Keeping an eye on this data will give you invaluable insight to the product’s performance. The Niche Hunter is another great feature built into the web app that takes a different approach and helps you discover niche products by looking at keywords. You can search keywords in a specific marketplace and category and receive a ton of product results. 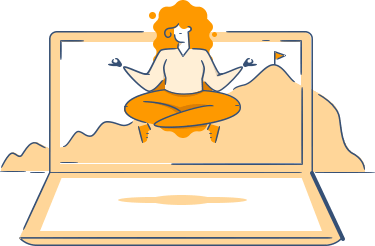 Working in tandem with the Web App, you can take your product ideas straight from the app over to Amazon where you can begin to utilize the Chrome Extension for a detailed sales scope. You can test multiple keywords from your search in the web app. For example, if you found a potential product opportunity for a “seed starter kit” you might also search “seedling pots” and “seed starter tray” etc. to get a dynamic view of potential competition levels based on a variety of potential customer searches. Once armed with a list of 20 product ideas that fit the criteria, there are two questions we can ask ourselves and test our product ideas to narrow down that list. Let’s start with evaluating demand. Sales distributed across a bunch of sellers, and not just dominated by one or two. Sufficient demand – if the top 10 sellers for a given product or keyword can sell an average of 10 units per day, then we would consider that sufficient demand. 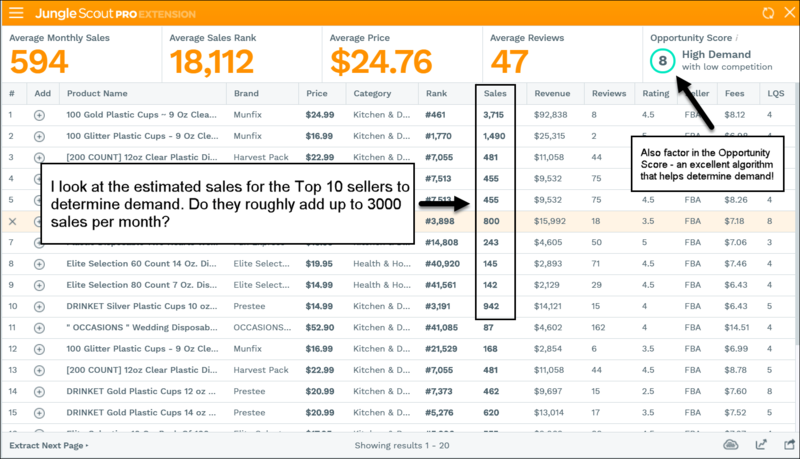 As a combined total, we’d like to see at least 3000 sales per month for the top 10 sellers. Why? Because if you average that out, that’s about 300 sales per listing and if you could get 300 sales per month, that’s about 10 sales per day. That’s a good number to shoot for. So what does that look like in Jungle Scout? Now we can evaluate the level of demand by looking at the top 10 results and seeing if there is roughly 3000 sales per month – this is just a rule of thumb we like to use as a benchmark. It can vary by product category or marketplace, but we want to see if these top 10 sellers are actually selling their products! A quick note about how the sales are distributed across these top 10 sellers – it’s not ideal to have a bulk of the sales dominated by one or two sellers. It would be hard to sell against them with a new product. Best case scenario, the sales would be relatively evenly distributed so that even the seller ranked 10th sells 300 units or more per month. When you’re evaluating the competition, you want to look at the reviews. Analyzing the number of reviews for a product is a huge indicator of potential competition. For example, if you’re looking at a product category and the top sellers all have thousands of reviews, it’s probably an incredibly competitive category. On the flip side, if you’ve discovered a high demand product where the sellers only have a handful of reviews, it might be worth getting into. Which is why we suggest looking for products with less than 200 reviews (with excellent opportunities below 100). Tip: Product reviews can also help you verify a good product opportunity. Read what others are saying about your competitor’s products and use that feedback to improve it. 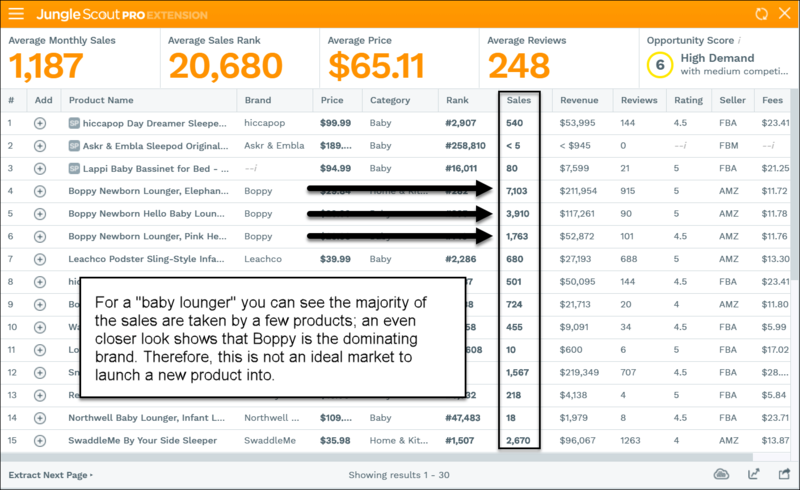 Using the extension, you can see the number of reviews for each product; if the first five results have less than 50 reviews, the competition is still manageable and leaves room for a new product to enter the market. Additionally, if there are a few products in the top ten results with less than 75-100 reviews, that’s another good sign! Taking a quick look at the competitive landscape using the Jungle Scout Chrome Extension is the fastest, and most reliable way to dig into your product ideas. But at this point, it’s important that you also track any products that you are super interested in for a week or more. You can add those directly to the Product Tracker in the Web App, and automate your in-depth competitor research. 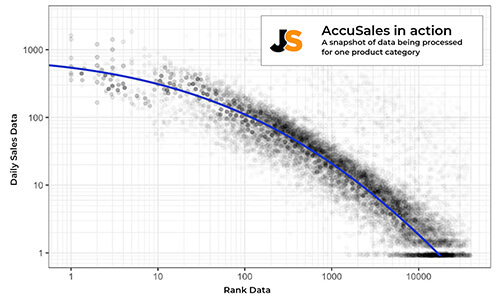 Amazon sorts every product in their database that has made at least one sale with its BSR hierarchy. Curious what your potential competitor’s sales look like each month? Our free sales estimator tool can take any product category and BSR ranking and estimate that product’s sales volume. All you need to do is select your marketplace and category, plugin the BSR from the extension, and voila! You now have a head start on your competition, AND a better idea of demand. As you can see, in the Top 10 results, half of the products have less than 50 reviews, and some less than 15! 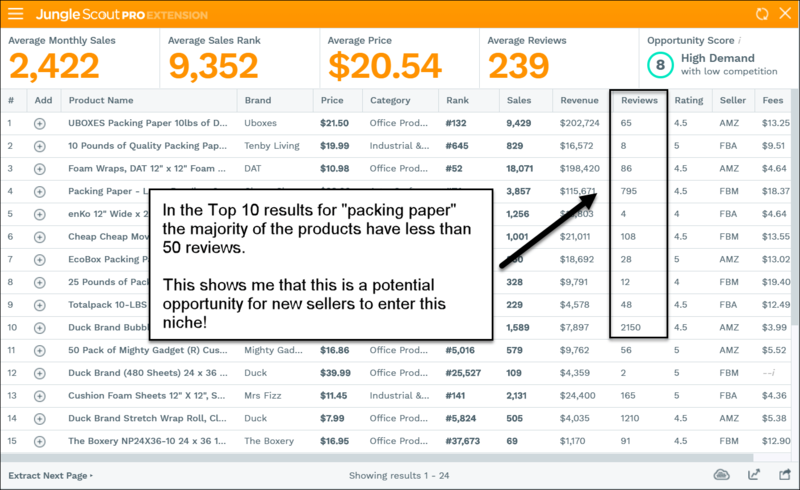 If you launch a product in this niche, you could quickly compete against these sellers after you get just a few reviews. This is good for us! Ok, now how do I find that million dollar product idea? There are a couple ways you can go about this, and a few schools of thought. Don’t sell what you want to sell, sell what sells. Logically, this focuses on the metrics and ultimately reduces risks you might take with a product you’re passionate about. Therefore, it’s often easier and quicker to profit. Sell what you are passionate about. The benefits of selling something you are passionate about is that you know all about the product which makes the learning curve a little less steep, and allows you to really hone in on branding. This directly contradicts the former school of thought. But in this world there is no right or wrong, it all comes down to you and the best fit for your business. Read more about the two product selection methods here. No matter which way you decide to go, one thing that you are going to need is accurate sales estimates to back-up your research, and maximize your chances of success. Beyond the subscription-based Jungle Scout products, we are constantly finding new ways to illustrate the product research phase and lead by example. We just so happen to have a real life product launch where we shared every step of the journey with full transparency! 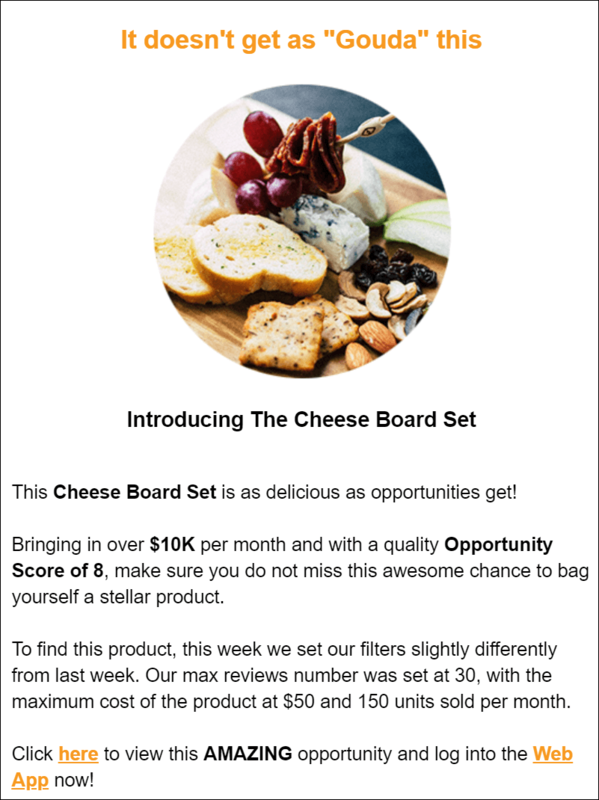 This first case study was for the US marketplace (check out the European MDCS here), and it is the ultimate learning experience for Amazon sellers. You can follow along and watch as the experts go through their product research and uncover a winning product opportunity that goes on to generate over half a million in revenue and growing. This is an excellent resource for all beginners to walk through the process of finding products to sell, and to refer back to it again and again. Sometimes you put so much thought and preparation into the research phase you forget to just start DOING IT! The way to combat feeling overwhelmed at the start of this process is to get started, and take it one step at a time. 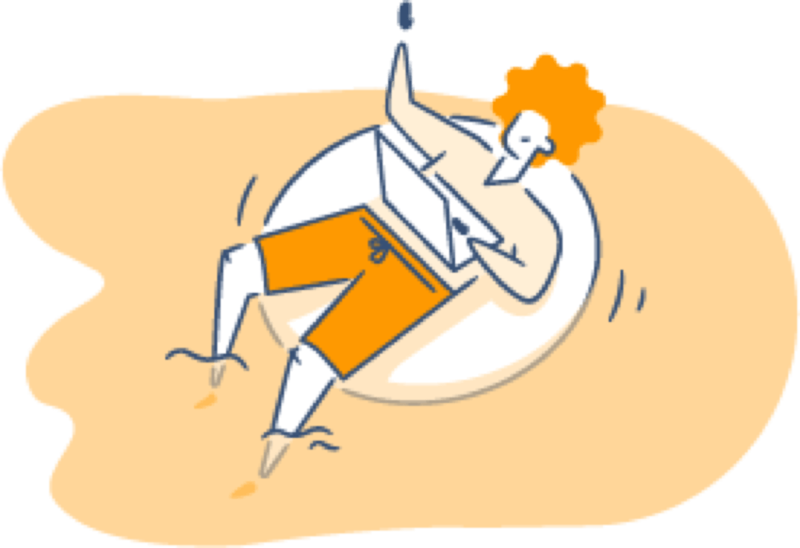 Good product research takes time… but the Jungle Scout toolkit enables you to unearth product ideas faster and with more accurate data than ever before. We put some of our own Jungle Scouters up to the challenge to find a product idea based on specific criteria – and only 5 minutes to do it! Of course let’s not forget the most obvious resource itself is Amazon! 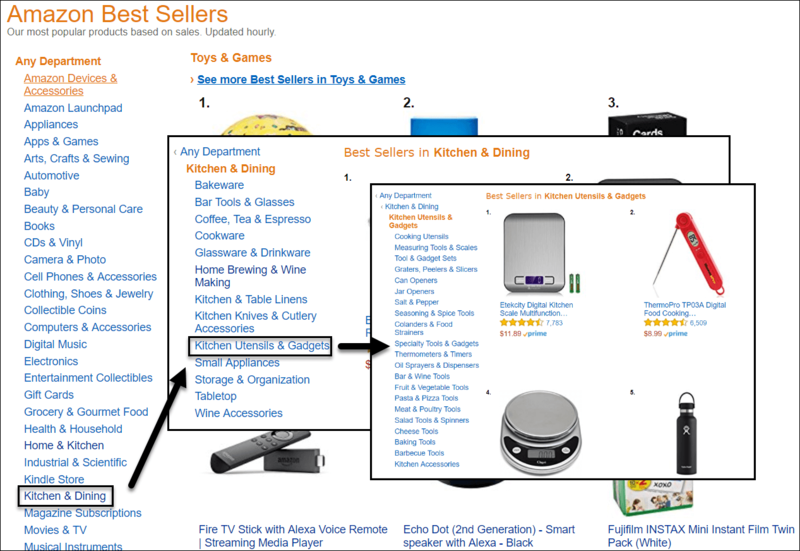 The best way to get product ideas is to look at what is currently selling well on Amazon. Consumer behavior will ultimately direct what to buy and sell online. You can go to the Amazon Best Sellers Category here, and browse through the Best Sellers depending on whatever category is of interest to you. Click through into the Sub-categories to get more opportunities. The main category Best Sellers are always very competitive, but if you drill down a couple levels and explore the sub-categories, you can find product ideas that have high demand and less competition – exactly what we’re looking for! 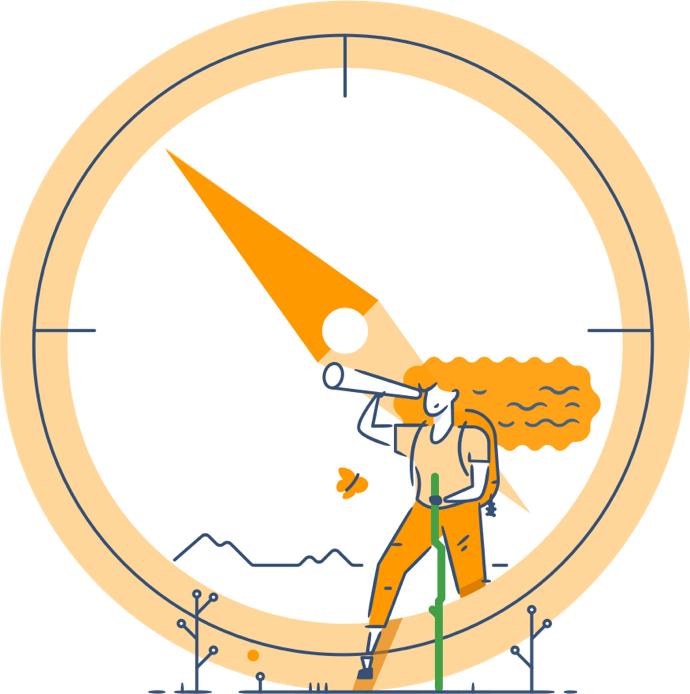 All of the data in the Jungle Scout tools are powered by AccuSales™ – our unique in-house algorithm that consistently updates Amazon sales estimates to help you make stronger business decisions and find those golden products. We process over 500 million data points per day to provide you with greater accuracy! 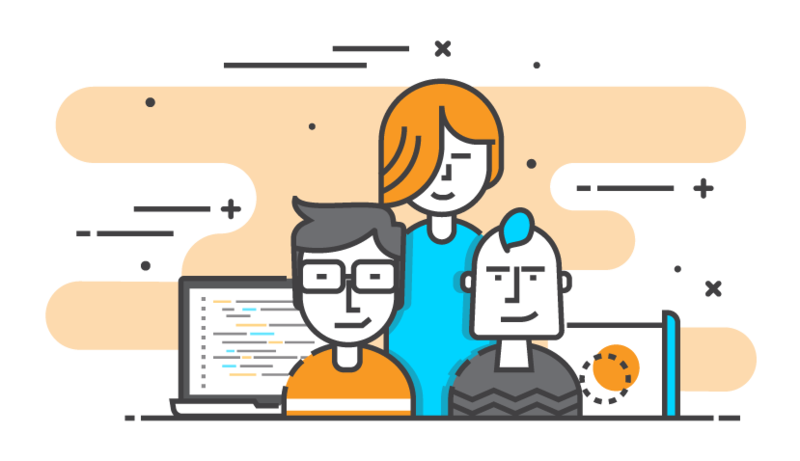 To top it all off, you also get access to our amazing support team, who are always there to help you at every step. Now that we’ve given you the basic research tactics we utilize every single day, you have everything you need to put together a long list of potential product ideas. Once you’ve gathered that list, we’ll be able to guide you through the rest of the process! Still hungry for more? 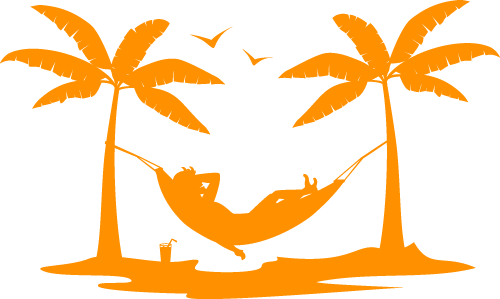 Jungle Scout University has everything you need and more to launch a successful Amazon business and you can find all of our free tools in one place. We’re excited that you are starting your journey to starting an ecommerce business! Amazon private label selling is super profitable, but it’s not some get-rich-quick scheme. It’s an endeavor that requires hard work and persistence, and those who are patient and thorough with their research will be the ones who discover success and profits. Best of luck to you, looking forward to hearing your success!